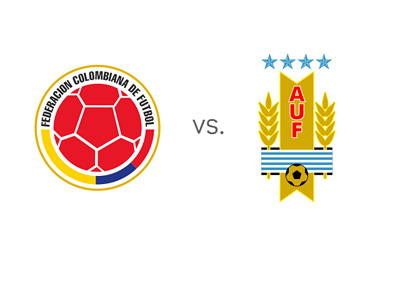 Old foes Colombia and Uruguay meet in the round of 16 of the 2014 FIFA World Cup on Saturday, June 28th, 2014 at the Estadio do Maracana in Rio De Janeiro. Colombia are sizzling hot at the moment. They won with style all three of their games in Group C, which also featured Greece, Ivory Coast and Japan. The team's midfielder, James Rodriguez (AS Monaco) and the forward Jackson Martinez (FC Porto) are the two standout players. Uruguay finished second in Group D behind Costa Rica and ahead of Italy and England. They lost their first match against CR and then famously beat England and Italy. Uruguay will probably have to play without their star striker, Luis Suarez, who is facing a lengthy suspension. Colombia are the favorites according to the odds. Colombia have a positive momentum, they are playing with flare and they managed to rest a good portion of the squad in their last game vs. Japan. Uruguay without Suarez are a different team. Will Edinson Cavani (PSG) and Diego Godin (Atletico Madrid) be able to carry 'La Celeste' to victory? One thing is for sure, both teams will have serious support from the stands in the upcoming game.